The Human Wellbeing Vital Signs directly relate to people’s interactions with the natural environment of Puget Sound and include familiar aspects of human health, such as clean air and access to local foods. They also include key measures of psychological and cultural wellbeing, like sense of place and ability to participate in cultural practices related to the environment. View the Human Wellbeing Vital Signs and Indicators for Puget Sound Recovery Technical Memorandum. The effort to address human wellbeing within the context of our Puget Sound recovery goals falls within a broader attempt to better understand the full spectrum of roles that people play in ecosystem recovery. Understanding the human dimensions of Puget Sound recovery helps to ensure a more complete, holistic, and ultimately more successful approach to achieving ecosystem goals. 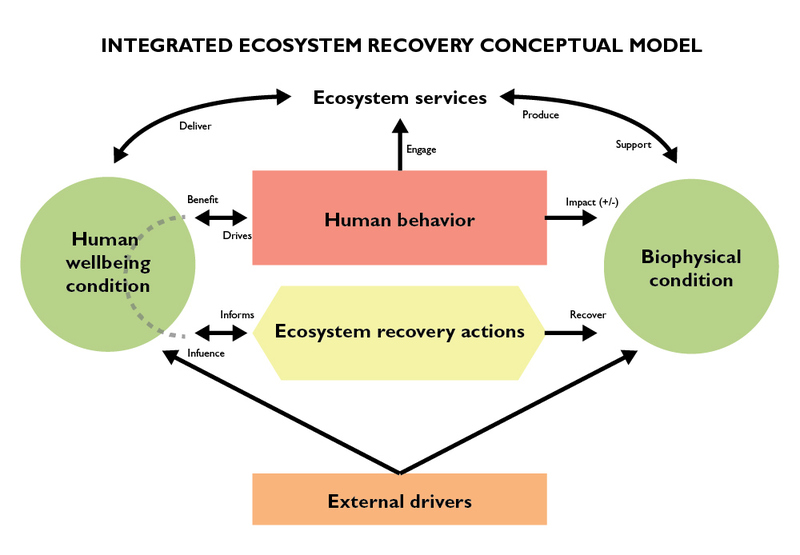 An Integrated Conceptual Model for Ecosystem Recovery provides a framework for understanding the diverse roles that people play in Puget Sound health. The balanced design of the model gives equal importance to the conditions of human wellbeing and ecosystems, showing that we can’t have one without the other. You can learn more about the Integrated Conceptual Model for Ecosystem Recovery at the Encylopedia of Puget Sound. To learn how local partners are addressing human wellbeing, see the Hood Canal Coordinating Council’s Our Hood Canal report. To learn more about human wellbeing studies and research in Puget Sound, see the Encyclopedia of Puget Sound.